"The present moment is passing. Don't let it go! Even when you are doing something very ordinary, do it mindfully, do it with attention. And I think, do it also with joy and love." 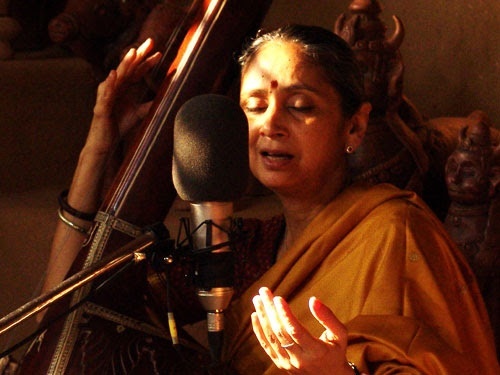 "I remember being deeply moved and just struck by how Vidya sings this piece, with deep experience of the words in her music, her face and her body movements -- there's a luminous quality to the performance almost. It's the first CD I bought from the Kabir project collection and the first few times I heard the song, there were always tears in my eyes. I never went beyond the first song to listen to the others on the list, for a while, since I always felt over-whelmed by this song! Now, it has this beautiful, meditative quality to it - the evocative description of the body as a musical instrument that can be made to sing the eternal song; and then amidst that heady metaphor, the gentle reminder of its impermanence...And the final wise warning from Kabir on the path of the brave being pathless! Perfection, Truth, Beauty!" "I think what Kabir invites us to do is taste the rasa, the flavour of the everyday, the ordinary. Whether you are doing your sweeping, or whether you are washing your clothes, or climbing onto a bus...this too, has its own taste. When he says 'sumiran kar' or 'Remember Hari or Ram', I think this is what he is saying. The present moment is passing. Don't let it go! Even when you are doing something very ordinary, do it mindfully, do it with attention. And I think, do it also with joy and love." In this song Kabir evokes the image of our body, our self, being like the five-stringed musical instrument – the tambura. Made of the four elements and containing the fifth element – shoonyata or emptiness – we hold within our self the capacity to resound to a higher sound. But only if we learn to be perfectly strung – not too tight, not too loose, but just so! The song is beautifully composed and sung in the thumri idiom by Vidya Rao, a performer of thumri-dadra and ghazal, who has studied under the legendary late Naina Devi, Shanti Hiranand and Girija Devi. She also sings songs of Sufi and bhakti poets, verses from Hindu and Buddhist texts and Islamic forms of naat, soz and nauha.